I’m sure we’re not the only ones who get into the office on a morning and find 7,754,489 unread emails from random sites, services and spammers. Some of them have handy little unsubscribe buttons within the email, but others take you through an online labyrinth just to press the “PLEASE STOP EMAILING ME” button. 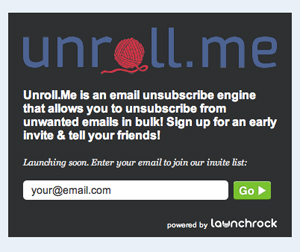 Well now a new service called Unroll.me aims to make unsubscribing from useless rubbish quick and easy. The clever tool works with most major email clients and searches through your inbox to present you with a list of everything you’re subscribed to. If anything on there looks a bit pointless, you can easily just hit an “Unsubscribe” button and your inbox will be clean and streamlined from now on. How clever. Unroll.me is currently in beta, so to be alerted when it’s actually up and running go and add your email address to Unroll.me now.